I like Kling and probably agree with him on most things. The central thesis of this book is that macro is bunk, and that micro is not. No disagreement there. He elaborates on this over a mostly-enjoyable ten chapters, and the resulting text makes for a pleasant little read.I didn't really get into the way that Kling approached this thesis though. He writes from a perspective that treats specialization and trade as largely extricable from the core phenomena of scarcity, preference, and comparative advantage. 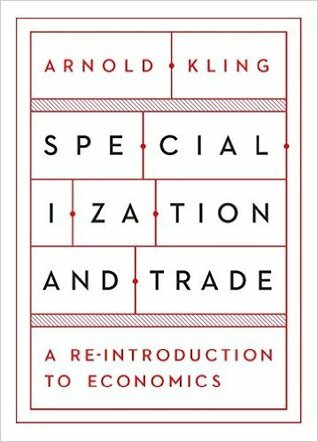 I take the orthodox microeconomic view that specialization and trade are the logical results of these phenomena; Kling himself sort of seems to accept this early in the introduction, but then asserts that he'll operate on the level of specialization and trade anyway. I raised an eyebrow very early on at:The phenomenon of specialization helps explain why we observe markets, firms, property rights, money, and finance.I think this claim is tautologically true for firms, but the rest feel like a bit of a stretch, or at least can be explained more naturally by appealing to scarcity, preference, and comparative advantage (à la Mises, for example) or even moral philosophy (à la Huemer) in the case of property rights. In retrospect I guess that Kling wanted to use specialization as a sort of abstraction barrier to analyze macroeconomic issues, but I didn't think this was clear, or that it worked tremendously well. If specialization and trade are to be the core units of analysis, then I'm really hoping for "an economist does his best Nick Land impression". But that's not what I got. Specialization and Trade is the kind of economic text that the world needs more of. Kling is heterodox through and through, using whatever approach he sees as reasonable no matter how many traditions he breaks with. At the same time, he really knows how to make himself understood and his reasoning transparent. The result is a book that's both innovative and a didactic masterpiece. If I don't rate it higher, then that's mainly because Kling is all over the place, talking about various methodological issues, the influence of the Fed, the shortcomings of Keynes, the role of economics in general and the effects of the division of labor. His ideas are more loosely connected and run across across a broader range than the title of the work suggests, yet they aren't complete enough to form a whole system. Specialization and Trade felt like it wanted to deal with a very particular issue but instead ended up a kind of unfinished systematic treatise. Even then, it's a great book that stands strong against the pseudoscientific tendencies of modern economics. This is a book that I'll recommend to students of economics who have finished grad school and just joined public policy: "Read this book. It is short but contains many useful lessons that call for much unlearning and rethinking. You will understand the ideas in this books, but not their full importance now. You will learn to appreciate them with experience. "I've been reading Kling for close to a decade now. This book is a good synthesis of his ideas. A small but clear book on rethinking how we approach macroeconomicsA great reintroduction to macroeconomics thru a different lens than the classical macro training. Kling does a fine job appealing to armchair economists while still keeping a certain rigor to the material. Clear writing from my favorite curmudgeon. Convinced me that a lot of the science underpinning current economic thinking is bunk. As usual, Kling's prose is crystal clear, and his ideas are thoughtful and thought-provoking. In addition to providing an excellent case for a trade and specialization based economics, he delivers a good economics primer and a persuasive case against basing economics on mathematical models. Arnold Kling - American economist, scholar, and blogger. He is an Adjunct Scholar for the Cato Institute and a member of the Financial Markets Working Group at the Mercatus Center at George Mason University. He teaches statistics and economics at the Berman Hebrew Academy in Rockville, Maryland. Kling received his Ph.D. in economics from the Massachusetts Institute of Technology in 1980. He was an economist on the staff of the Board of Governors of the Federal Reserve System from 1980-1986. He was a senior economist at Freddie Mac from 1986-1994.